The marvellous recent release of the best seller recording by Howard Shelley of three of the ca. 22 keyboard concertos still surviving (Kozeluch, in fact, composed ca. 40 keyboard concertos for piano and in part possibly for harpsichord) creates the occasion of reconsidering such works from a prestigious and high point of view. About Kozeluch, his teacher, his career in Vienna and his controversial relationship with Mozart, Haydn and Beethoven we have already written about previously (see The Bugler October 2016). Kozeluch's position in Vienna was made easy by his cousin Kozeluch, who was a pupil and collaborator of Gluck and Gassmann, who were also the mentors and teachers of Salieri. It is not perfectly clear from the sources, but it seems that in 1780s he reached possibly some sort of unwritten agreement with Mozart, with Mozart appearing more as the public piano performer and improvisator and Kozeluch as the leading piano composer, increasing his reputation especially through publishing and selling the scores of his piano concertos and piano works and having them performed by other famous pianists, like Paradis (Kozeluch's most famous pupil). As a matter of fact, Kozeluch was, in Vienna, a composer-publisher. 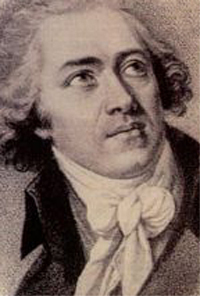 In 1784 he founded his publishing firm, the Musikalisches Magazin, and through this he managed to build the fortune of his own reputation and of his own works, various times aiming more to the easy market of the multitudes of amateurs purchasers than to the market of the first rate music professionals. A problem well known also by other composers, like Dittersdorf and, various years later, Carulli. It is a well known problem also with Mozart, who had difficulties in selling his own works deemed too difficult and incomprehensible for the average music player (i.e. his Dissonance quartet and other works, etc.). And this situation led Mozart to some unpleasant forms of clash with renowned publishers and personal friends like Hoffmeister, who sometimes found the distribution of Mozart's too demanding music a real hard job (in particular, on a financial level). The enormous popularity of Kozeluch as publisher of his own works even caused Mozart to assure Puchberg, his creditor, in July 1789 that he was going to publish some new works through Kozeluch's popular publishing firm. But this never happened... and Mozart (a sort of frenemy of Kozeluch), for some reason, didn't manage to earn some money, by exploiting the popularity of Kozeluch's firm. The intrinsic quality of Kozeluch's pianism is well known, especially in the case of his works for solo keyboard. The style of his piano writing full of grace and sparkling character is still a mark of distinction also in his piano concertos. Nevertheless, Kozeluch's writing for the orchestra is thin, modest and with a lesser amount of incredible inventions, if we make a comparison with Mozart's own piano concertos (many of them written in the same period in the 1780s). But, in reality, this is the point... in the 1780s if you wanted to become rich through publishing music works you had to make some hard decisions on a marketing level: art before money or money before art? The choice of Mozart for art somehow certainly cost him dearly then, but consecrated him afterwards. Kozeluch's interest in the managing responsibilities of his firm led him, instead, to some easy choices also on an artistic level, by creating music which could be easily performed by some small-scale chamber ensembles with various non-professional musicians, even though Kozeluch was perfectly able to do a little bit more with orchestras. For this reason, someone found these three concertos by Kozeluch more similar to Mozart's own K.238 and K.246 than to Mozart's famous great Vienna concertos. 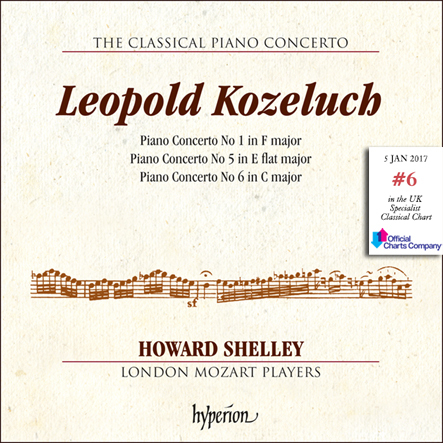 All this said, the beautiful performance of Howard Shelley and the fine brilliant style of Kozeluch's music guarantee the enjoyment of these lovely works of the 1780s Vienna.